Goodbye FLO TV. Hello, Service and Device Refunds! Qualcomm (s qcom) today said it would offer refunds to certain customers who purchased devices and contracts to watch its mobile, live, television service. 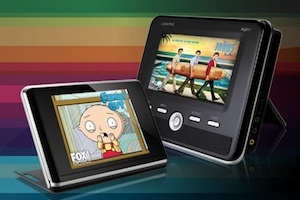 The service, dubbed FLO TV, was first offered on handsets in 2007 through carrier partnerships, and Qualcomm began offering its own mobile televisions direct to consumers in November 2009. But more devices weren’t enough to save the television service, which was expensive and appeared to offer consumers something they just didn’t want. In October of this year, Qualcomm announced it would be shutting down the FLO TV service March 27, 2011. Customer rebates vary, but will include both some money for the hardware and a pro-rated amount for unused service. The bet Qualcomm made on personal, mobile, video content simply didn’t pay off, even though in theory, the idea was sound. The company leveraged its core competency in wireless technology to build a small television network using 716-722 MHz spectrum it gained through auction. But as our own review showed, $14.99 per month for limited content on yet another device to carry around didn’t appeal, especially when that network only covers 68 million Americans. Given the growing amount of video content on the web that can be watched in more places and companies such as Hulu, Netflix (S NFLX) and YouTube (S GOOG) now providing it, FLO TV was the perhaps right idea at the wrong time and not in enough places. In Qualcomm’s defense, it’s relatively rare for a technology company or content provider to offer refunds when it fails to deliver on its promise. My colleague Stacey pointed out the demise of the laserdisc some 30 years ago and how customers who invested in fancy players were left with relatively little content to enjoy. I experienced a similar “laserdisc moment” more recently: I bet on HD-DVD over Blu-ray in the high-definition packaged content wars and I lost big. Instead of hardware to watch beautiful movies on my television, I’m left with a small paperweight, with no chance at recouping a single penny. So if you own a FLO TV, take solace. Sure, there’s no more FLO TV, but at least you’re likely to get a little something back for your new paperweight. I have used my FLO TV at work for about 8 months. I don’t have access to a wi fi there and it kept me company while I do the most boring job ever. Does anyone know of another provider? Remember, I can’t get wi fi there. It’s a trucking company. Any comment about MobiTV? They have achieved a much higher adoption than FLO TV, but are fundamentally in a very similar space. Please let this be the last attempt at single purpose, dedicated, proprietary hardware! Hundreds of millions of people already carry a generic device ( iphone/Android ) just write software for that target. No one will carry two devices on them anymore. Garmin, Flip, TomTom, Flo, etc. all catastrophic money losers – give up, stop trying please.